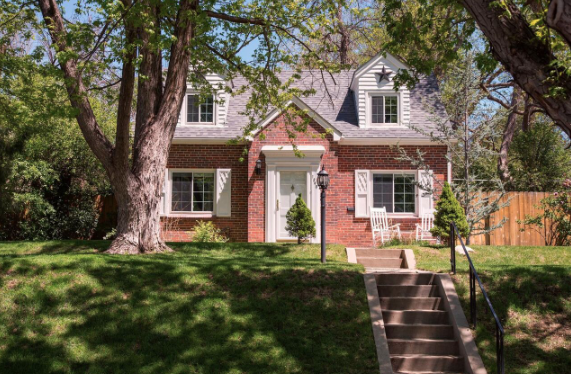 This beautiful home features an open floor plan with nine foot coiffured ceilings, original tile surround on the fireplace, and impeccable wood work throughout the main floor including custom built-ins. 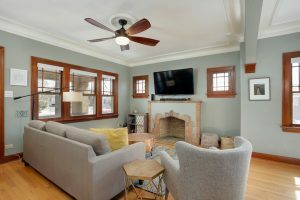 Additionally, wood floors run throughout the main living spaces and new light fixtures throughout the house highlight the inviting charm of this home. 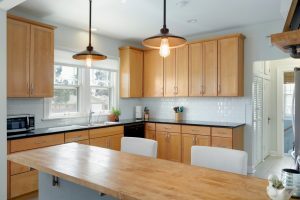 Thoughtfully updated, the kitchen has been opened to the dining room with a butcher block breakfast bar perfect for entertaining, getting a little work done or enjoying your morning cup of coffee. Stainless steel appliances, quartz counters, Shaker style cabinets, Quartz counters and white subway tile backsplash welcome you into this space. This kitchen is complete with extra storage in the pantry and mud-room area. The master bedroom suite was recently expanded into the original sunroom to add additional square footage and walk-in closet. 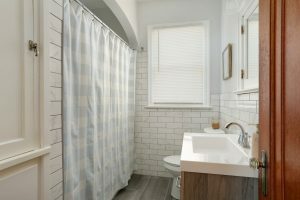 In addition, newly renovated hall bathroom features new floor tile, subway tile in the shower, vanity and fixtures. 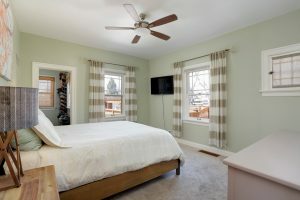 Spacious secondary bedroom boasts a walk-in closet and hand painted mountain skyline! 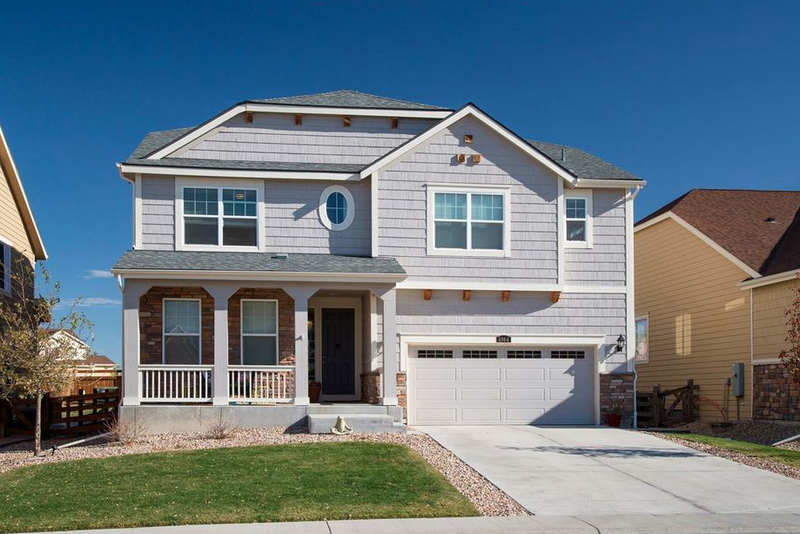 Additionally, the full sized basement is perfect for entertaining with tall ceilings, brand new carpet throughout and wet bar adjacent to the spacious living room. Full bedroom and 3/4 bath make this space a cozy retreat. As well, don’t miss the large laundry room, roomy utility room and two additional storage rooms. This house has it all! Need more storage? Additionally, the two oversized garage has you covered! Did I mention it was south facing which means snow shoveling will be a breeze? This house is move in ready. All you need to do is enjoy the flagstone patio with custom pergola, low maintenance turf yard and custom raised planter beds. What’s not to love? 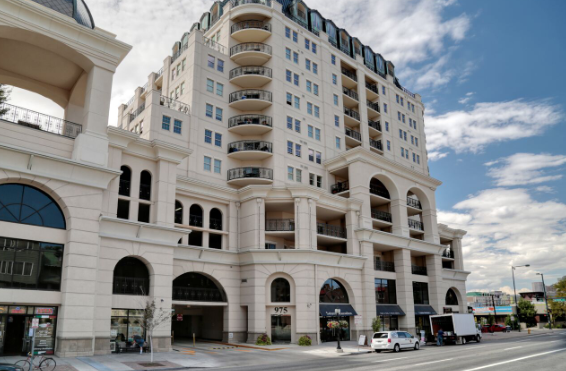 Oh and it’s steps from the best Broadway has to offer along with River Pointe shopping center. With easy access to the highway, two light rail stations and Platt Park just a stone’s throw away this home is a grand slam. This home has a new roof and gutters! Sewer line repairs? Made in 2016. What could be better? Interested in taking a look? I would be happy to schedule a private tour.